Chung Hyeon wins first round at Australian Open. January. 16, 2019 07:47. by Jong-Seok Kim kjs0123@donga.com. Chung Hyeon clinched a tough first-round victory at the 2019 Australian Open, the first Grand Slam tournament of the year. 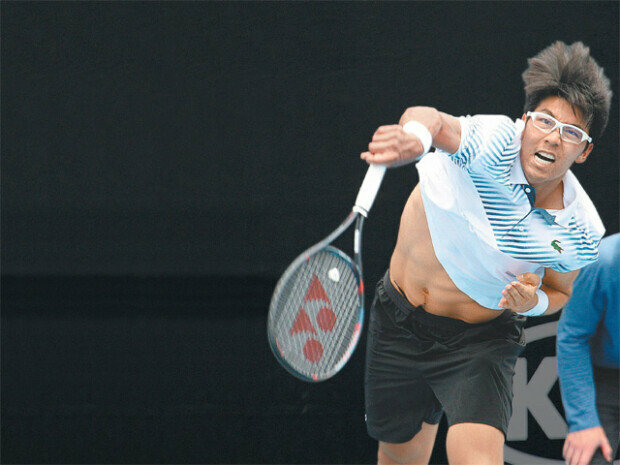 Chung, ranked 25th in the world, sealed a 3-2 (6-7, 6-7, 6-3, 6-2, 6-4) win over left-handed American player Bradley Klahn, ranked 78th in the world, in the first round match held at Melbourne Park on Tuesday. Last year, Chung became the first Korean to be the Australian Open semi-finalist. Chung dropped first two sets to Klahn on Tuesday. In all of the two tournaments Chung competed this year, he suffered a loss after leading the first set 5-1. But he did not give up this time. It was as if his fighting spirit from last year’s competition came back. At last year’s Australian Open, Chung suffered a severe blister injury that forced him to retire from the tournament. With the support from KATA, amateur tennis club, and other 400 Koreans fans at the stadium, Chung won three sets in a row with his strong strokes and sharp serves.